As a Chartered Chemical Process Engineer (as denoted by the IChemE suffix) I am glad there is now a corner that represents my people, I am sitting here comfortably as I write this. We would also happily accept our other STEM contingents so come join us! I have to preface this review of Birdman by saying that this kind of film was right up my street. As an independently minded, foreign director helmed, black comedy film featuring recently sub-par actors (Keaton, Galifianakis, Watts) who were pulling out the all the stops I loved the idea at conception. Then I saw the the film and was blown away from it from the first scene and sentence. 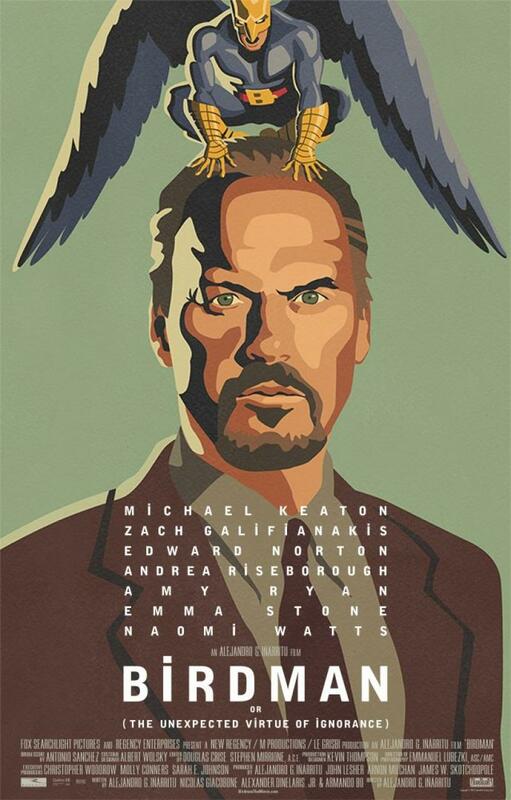 Birdman is genuinely inventive on many counts. Firstly, the idea of the story progressing “one take” propagated by a steady cam and invisible edit points was astonishing. I have not been taken in by such inventive cinematography since Gravity, so it was no surprise that it was shot by the same DP (Director of Photography) as Gravity was; Emmanuel Lubezki. Secondly, the way that the minimalist jazz drum score drives the film forward was fantastic. I now have the soundtrack on constant repeat. Thirdly, the genius casting of Michael Keaton to reference to a failing actor from a film franchise. Who else could it have been? Val Kilmer’s Batman? Brendan Routh’s Superman? Michael Crawford’s Condorman? None of the above would have sufficed! It should be noted that all these points would add up to a gimmicky if it wasn’t for the story and the way that it unfolds. Riggan Thomas, Keaton, seems to have everyone against him; his daughter, his ex-wife, his new-love interest, his manager, his fellow actors and that strange hidden “Birdman” character push and pull him in multiple directions. It’s impossible to know which way he could turn. On top of all this it is genuinely funny! I love it when you leave a film and you aren’t quite sure what happened and you know that you’ll have to watch it again and soon. PS – Can I just say that I thought Sanjeev Bhaskars interviews last week with Michael Keaton and Eddie Redmayne were totes amazeballz? That is all.